In order to demonstrate our new website, Church Chair Finder, we’re offering $50,000 in free chairs to churches through August 21, 2013. WHAT IS CHURCH CHAIR FINDER? 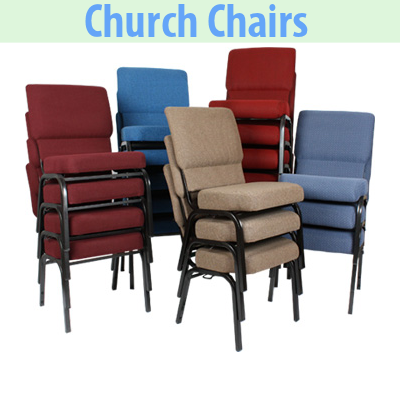 Church Chair Finder is a free website designed to make finding the right chairs for your church easy and affordable. At Church Chair Finder suppliers compete for your business – getting you the lowest price! No longer do churches need to spend an exorbitant amount of time and money in order to find new church chairs for their sanctuary or worship center. At Church Chair Finder you simply fill out a quick online form and over the next few days you will receive FREE print-ready church chair quotes from several trusted suppliers. You can bring these quotes to the decision-makers in your church and then decide which church chairs (and suppliers) to pursue. You do not have to worry about sales calls from third parties or your email box being flooded with SPAM. With one simple form submission you will receive up to 5 separate church chair quotes all based on the criteria you selected! Finding the right church chair and the best price has never been so headache-free. WHY ARE YOU GIVING AWAY FREE CHAIRS? So churches can learn about us! We have spent many hours creating a no-hassle way for churches to find the best quality church chairs at the absolute lowest price. However, as with any new website, we need to introduce people to it so that they can get excited and tell their friends. It is our hope that your (free) experience with Church Chair Finder will be so rewarding in the time and money you save on church chairs that you will recommend us to other churches — that is why we’re giving away $50,000 in free chairs! HOW DO WE RECEIVE FREE CHURCH CHAIRS? IT’S EASY! Submit a Church Chair Finder Quote Request (it’s free) between now and August 21, 2013. Take a look at the church chair quotes you receive in your email – when you or your church decision-makers have decided on which chair/quote (or quotes) best fits your church’s needs, contact that supplier via the phone number provided on the quote and give them this code: SYCM082113… And a portion of your chair purchase will be free. Yes, it really is that easy. HOW MANY FREE CHAIRS CAN OUR CHURCH RECEIVE? Each church will qualify for up to $1500 in free church chairs! To find out how many free chairs your church qualifies for you must submit a quote request, contact one of the suppliers who sends you a quote, and provide the promo code above. They will let you know how many free chairs your church qualifies for before you make your purchase – every church qualifies for free chairs!! ARE THERE ANY HIGH-PRESSURE SALES? Absolutely not! The entire mission of Church Chair Finder is to give you a pain-free, hassle-free, worry-free, and risk-free church chair buying experience. All of our verified suppliers are required to treat every church with respect and to never engage in any high-pressure sales tactics. ARE WE UNDER ANY OBLIGATION TO BUY CHAIRS? No. Submitting a Church Chair Finder Quote Request puts you under no obligation to buy or even to contact one or any of the suppliers who provide your church with a quote. Contacting a supplier and providing them with the promo code will not put you under any obligation either! Pain-free, hassle-free, worry-free, risk-free! There is no risk, no obligation, and submitting a quote request is easy and free. You can submit your quote request now by clicking here or by visiting ChurchChairFinder.com. I am looking for used church furniture; we need pulpit chairs and podium. I have no idea what the cost would be but I would like to get it on a payment plan or a layaway plan. We have a very, very, small congregation and this would be my donation to the church. Can you help me find something like this? Please feel free to call me or email. My phone number is 201-281-6729. Thank you. How and what can we do to receive free chairs for our church? I am looking for 40-50 church chair with pads. We are a new ministry with a small congregation. Please contact with a quotes . We will keep an eye out for any possibilities for you. Thanks! Please give one of our team a call at 419.469.6411 and we would be glad to work with you. PLEASE ASSIST US WITH SOME CHAIRS AND PULPIT AND PODIUM,WE ARE A NEW CHURCH SERVING JESUS CHRIST AT THE END OF TIME AND WAITING FOR FOR HIS RETURN.MAY GOD BLESS YOU.PLEASE CALL ME AT 678 651 3523. We’re a new church in Cookeville TN. In need of some churc chairs, and pulpit. Please help us if you can. We are moving into a new church building and are in need of 125-150 church chairs and a pulpit. I am praying and faith believing that God is going to supply our need. We need help getting these chair and pulpit. I can be reached at ghays11@yahoo.com. I’m praying and expecting a miracle that God will have his way and that our church will be blessed with your help. We are in the last days and we need to reach the lost souls. In Jesus name Amen Thank you and God Bless. Thanks for your comment. Probably the best course is to invite you to give one of our team a call at 419.469.6411 to see if we can assist. Please feel free to give one our team a call at 419-469-641q to see if we can come alongside you. Hello. We are a small private preschool in need of 35-40 preschool chairs. A 12″ seat height is most desirable. If you have plastic chairs with chrome or steel legs that stack, you have what we need. We have little to no budget due to operating solely on what the little preschool brings in each month. But, we need to replace the 30+ year old chairs and provide safer seating for the children. Can you help us? We are located in central PA. Thank you and God Bless you! Hello! I am looking for free used church chairs/pews, podium for our church. We are a very small congregation and are just moving into a new building from meeting in our local community center. Could you please help us find information on where chairs or pews are being given away. Thank you for all of your help! We have just opened a new church and need approx 400! What a Blessing this would be! Wow, thank you so much! 864-367-2906. Hello and good morning. I know i’m past the date but if by any means there is still a chance for chairs please contact me. Our congregation is small and our sanctuary we are in need of so many things my heart is heavy over it. Im just going to trust and believe in GOD to direct some to us. All Praise be to him. Our Ministry is presently seeking for pews and chairs possibly free. The ministry experience a terrible water damage. Please contact us at (336) 343-9620. We look forward to your help. Our ministry is seeking free pews or chairs if possible.God bless you and please contact me at 856-655-7665. Thank you very much. Hope to hear from you soon. We will keep our eyes and ears open for a potential solution for your church. Each month we have dozens of churches contacting us who are looking for free pews or free chairs and sometimes things work out. Blessings! Hello and Happy 2014. I know i’m past the date but if by any means is there still a chance for Faith Temple Worship Center of Spindale NC, 28160 to get chairs please contact me. Our congregation is small and but our sanctuary big we are in need of so many things my heart is heavy over this. Im just going to trust and believe in GOD to direct you all in helping us. ++Bishop Tracy L. Martin. Bishop Tracy Martin call us at 828-395-2057 are church can hold 500people but at this time we need about 50-60 black chairs or navy blue padded chairs…. Hello we are in need of some chairs possibly blue in good condition and also a desk for the pastor’s office. We are a new ministry and hope you can help us. Am a member of Mchengautwa CCAP Church and the church has just been built . We need 1000 single seater chairs to suit the congregation. I am writing to see if your organization could be of help to our ministry. Our church is in desperate need of 100 chairs for our fellowship hall. The current condition of our chairs are in very poor condition. Some broken and most stained and worn out. I am a Minister at Serenity Baptist Church in Paterson NJ. If you could be of help it would be such a blessing to our church family. Wishing you peace,love, and abundant blessings always. We do not provide chairs directly, the best way to see if someone can help is to call Church Furniture Partner at 419-636-6411. Please contact us if you or your partners have information about Sanctuary chairs. Hello we are in need of about 50 Church chairs. Any and all help is greatly appreciated. We are a small congregation that believes everything is possible through Jesus Christ. We are in need of 100 church chairs stackable prefer. Looking for chairs for outdoors ministry& outdoors revivals. Have some folding chairs. We are new church in Chesapeake, VA and we are looking for 50 church chair. Please send us your best price. We are a very small church just starting out and would like to have some chairs about 40-50. THIS WOULD BE A BLESSING IF YOU COULD HELP MY GROWING MINISTRY OF 2 YEARS. WE ARE NEEDING 100 GOLD COLORED CHAIRS, CLEAR ACRYLIC PODIUM AND COMMUNION TABLE. I WILL ALSO COMPLETE THE REQUEST AS RECOMMENDED ON YOUR SITE. THANK YOU AND GOD BLESS YOU. I am curious, has anyone received any free chairs? im the pastor wife annie jones the reason why im writing because we really do need some church benches for our church.MAY GOD BLESS YOU. looking for at least 100 to 150 chairs, podium, pulpit, serving set for the Lord’s supper, just starting a church. Would like info on the free chairs. Located in St Louis, MO. I am pastor Freemam. Our church is a new establish ministry here Nashville TN. We really need help of chairs. Kindly help us. I am a member of a very small church and I am working to help my church find 100 – 150 banquet chairs in good condition for free. We are located in the Maryland area. Thank you and God Bless. Hello and good evening. I am establishing a new church in Carrollton,Texas and I am in great need of chairs and or pews with kneelers. Please contact me at 323-715-7733. Thank you so very kindly. I certainly look forward to speaking with you. Goodnight and God bless. Bishop Darrell C. Hartley, D.Min. My husband which is the Pastor is in need of 70 chairs for a new establish church that is starting from nothing. We also are in need of a pulpit. We are striving to do the Will of God and making sure that the foundation is laid properly. I have looked and have seeked we thought we had an answer with chairs in another State but when we thought the business was completed there was no finalizing of the business. So if possible if you would help us we would Greatly Appreciate your help, Thanks! Hi we have been blessed with a Church that had all pews equipment and podium stripped out! We are in need of Chairs or anything else that we can use! We have very few members at this time! Any help from anyone would be grateful! Thanks in advance Carlos down and n Alamosa Colorado Pentecostal Church on State St. God bless!!!! we are beginning a church and in need of 20 -30 church chairs. As you know it is not easy in the beginning and funds are low. Could you please direct us. .please if you do contacts Us by e-mail.venisepaul5@gmail.com please. or call 6177920357.God Blessed u ! United Haitians Pentecostal Church we will keep u in an are prayer. Thank u an advanced. Reverant pastor Romanes L Paul. WE ARE A NEW CHURCH LOOKING OUT FOR ANYONE TO BLESS US WITH 400CHAIRS. I am the Pastor of Rehoboth Breakthrough Ministry in Greenwood, Ms. We are in need of a blessing, we need church pews for the ministry can you please help. Contact Pastor Flora or Elder Mack Dukes at (662) 457-1854. May God bless you and thank you. To discipleship leaders please contact me. 443-786-6534. We are moving into a new church building and are in need of 100-150 church chairs and a pulpit. I am praying in faith believing that God is going to supply our needs. We need help getting these chair and pulpit as soon as possible. I can be reach at ricardo.recinos@yahoo.com. I’m praying that God will have his way and that our church will be blessed with your help. In this last and difficult days we are praying and working as diligent we can to get the job done, please help us and be part of our vision. Greeting in the name our lord Jesus . I am a young minister in this church that the lord call me to lead we are in dispirit need of help with chairs. may lord continue to bless you and yours . I pray for this ministry and everybody needs , that good provide . God will provide our need according to his riches in glory thank you for what you do in the name of Jesus . Amen . The name of our church is OMEGA FIRE MINISTRIES in Dallas, Texas a local branch of Omega Fire Ministries Worldwide founded by Apostle Johnson Suleman (a former Muslim who encountered Jesus Christ) and has a compassionate heart and calling to wipe away people’s tears. For authenticity please check him out on you tube or google to glean from his messages, teachings, and ministrations. The Dallas church started in March and has been holding services in hotels which is very inconveniencing; but at the service yesterday the pastor announced a more convenient venue has been found for the church to move-in by the first of the year. The church would be needing about 100 chairs, sound system, drum set, carpeting, projector, 2 computers, a base guitar, mixer, and a regular guitar for a start-up please. The pastors name is: Collins Aifuwa, and his email address is: fotoplex96@gmail.com. His phone number is: 432.599.1751. I am so glad to see the posting you published since May and may the Lord bless you un-endingly for having a heart to donate to ministries to help . May the Lord beautify your life and crown your efforts with his glory and greater harvests in the mighty name of Jesus, amen! in his services and more grace to you sir. I need 50 free church chairs. Our church is a small group that is currently getting set up and most of our funds goes to assist persons in the community, so we have little funds as we are a non-profit organization. It will be a blessing for us if we some of the free chairs for a new beggining church . The name of the is Jesus Christ Worship Center. God bless you….we are in need of 150 to 200 burgundy chairs..we are moving to a new building please help us getting start we are a Spanish congregation with a big heart to help the needed our church name is Escuadron de Guerra…thank you and have a bless day. Planting New ministry in need of everything from chairs, podium, bibles. Starting from the ground up. Anything would greatly be appreciated. Thank you! My husband and I have been pastor-ring for quite a few years now. We are an inner-city ministry with a heart for the people. Currently we are in need of folding chairs as our ministry is expanding. Is there anyway that you can help us? Our phone # is: 937.279.0895. Thank you so very much for whatever you can do. Grace & Peace. My name is Dr Kelly Scott and I am the senior pastor of a small ministry in Harlem called Way 2 Life Ministries. We are relocating to a new location and we need 35 -50 purple chairs for the sanctuary. We are believing God for assistance. Any help your organization can give we would be greatly appreciated. Our Church has 350 padded, cloth chairs in very good condition. We are selling the chairs for $10.00 each to help offset the cost for new chairs. I am looking to purchase 30 chairs for our non profit Org. can I have a quote for folding chairs/staking chairs. preferable. Our church is a historical church. It was built in the 1800s. The old pews were built by slaves. We need 100 padded chairs. We are praying for a grand piano. All donations ls appreciated. Our Church is an historical Church. It was built in the 1800s. The pews were built by slaves. I forgot to put my phone number in. We are looking for 50 to 100 navy blue chairs or whatever you can bless us with for our santuary. We need 50 to 70 blue or navy blue chairs for our santuary. Thank you! Our Church is a historical Church. It was built in the 1800s. The pews were built by slaves. me at 386-496-3669. May the good Lord bless you for giving. at 386-496-3669. May the Good Lord bless you for your giving. Please advise if you can furnish [donate] 100 padded cushion Chairs to Ascension Baptist Church, located at 3803 Regency Parkway, Suitland, MD 20746. Pastor Wilbert Campbell, Jr.; Phone: 301-420-7221 or 301-350-0942. Thanks for your consideration. I am looking for a donation of 300 chairs for a new church build in Puerto Rico. Please contact me at: 787-764-3837 or florma57@yahoo.com Thank you so much. God will give you blessings. We are a new church in need of church chairs cushioned(50) and chairs cushioned(100) for our fellowship hall. Also we have a need for sound equipment, musical instruments. My number is 254-238-1753. Thank you and God bless. I am looking for a donation of 300 chairs for a new church in Quincy FL please contract me at (850) 743-8993. MY name is Pastor Clarence Parker Address is 202 Mcarthur St Quincy Fl 32351. Email address is Cjp241963.cp@gmail.com. Hello my name is Bishop Bethea and I am looking for a donation of 100 chairs( black or purple)for a new church in Warner Robins Georgia 31093. Also we are in need of pulpit furniture . Please contact me at 478-334-9177 thank you. Is this offer still available? If so, how do we go about getting 100 chairs donated to our church? Our roof fell in due to weather and we have to redo the inside as well. We are located in Houston Texas. Looking for 200 chairs for a new start church in Roanoke, VA. Look forward to hopefully hearing back from you! We need a donation of 54 chairs! Our churches in Ocala Florida. We are in need of 40 folding chairs for our church fellowship hall. We have a small congregation. Thank you in advance. Hi. Godd bless we are new ministry dedicated and bring people to the lord is our priority, we are in desperate needs of sounds equipment and chairs. They can be at reasonable clearance price or used or please if anyone is willing to donate to our ministry we are willing to accept. We can be reached at 913 – 915- 0373 Thank you a favorable reply ..
Is this offer still available? If so, how do we go about getting 100 chairs donated to our church? We need 50-60 chairs. We need about 60 or 70 chairs for our church another church came & took there chairs back. We need them badly . ( GOD ) bless . and thank . My name is Cheryl Lewis, and I am the Administrative Assitant for our church. were located in Washington, D. C. . To god be the Glory, if the offer still stands. We are a small church, but growing, going on our 13th year, and really in need of church chairs, 100 chairs would be a blessing. I can be reached on (301) 415-2873 during day until 5:00 and any other time on (202) 384-2828, You are truly a blessing. Back in August 2018, my church was damaged by a falling tree which made a hole in the church roof. Through the hole, water came in and destroy all inside. For past 4 months, owner church has renovated the building. However, with the inflowing water, 100 church chairs were completely damaged. This is not something owner church cannot reinstall. For this, I would ask your support in obtaining 100 church chairs. We will certainly keep this in mind as we hear of churches with available chairs in your area! We are a small congregation need 100 cushion black chairs or brown and a clear podium asap,trying hard to get started by April 2019 our finances are limited please help and send quote. I will keep this in mind if we have a church in your area getting rid of chairs. Thanks! Litrock org have been helping needy people locally and internationally. We are launching a youth Ministry in an area that is underserved, we would be happy to receive the help of 200 chairs.